The television series, Samurai Jack, is an artistically well-depicted cartoon guaranteed to entice viewers of all ages and genres. The television show is not strictly action-based, nor does it follow a script in which is unbearably predictable. The combined use of storytelling and adventure will unfold a culture so undeniable and a world so unique to the audience. The world of television has never been so historical and modern, while still providing induced revelations of each mini-story and character introductions continuous. Samurai Jack is the protagonist that leads our viewers into an entirely unknown, yet compelling world full of numerous dimensions and time periods. His character is mainly symbolic and a beautiful representation that portrays a long line of samurai warriors and their art mastery, specifically that to a blade. He must travel through time on many different occasions in order to hone his skills as a samurai, forging a path to survival. Jack's only true incentive for accepting and coming to terms with the challenges that are presented to him is his pure determination to get back home. Essentially there is very little dialogue, which allows the series to stay simple and at the same time preserving profound quality. An absence in dialogue fills the mind with the idea of tranquility as the music later settles in. The art and graphics that come along with the show itself are impressive. When we first take a look at the art and how it's clearly able to capture and instill a calm, however euphoric feel to it. A picture that is fully enriched with empowering bold ancestry and paintbrush refinery. The antagonist, Aku, a powerful demonic-like creature that can change his physical appearance, also known as a "shape-shifter," fulfills the ancient prophecy that throws Jack into his inevitable long journey across the globe. Each scene which involves the use of martial arts and weaponry calls for the knowledge accumulated from his scholars, mentors, and masters of the sword. Samurai Jack's performance stays impeccable in order to measure up evenly with Aku's ongoing plans for him. Jack's worst nightmare comes to life when he faces off against Aku, and the demon makes a shocking find about Ashi that puts her in harms way. The blooming relationship between Jack and Ashi takes a twist after they are hunted by one of the galaxy's most deadly creatures. Jack and Ashi defeat a slew of dangerous physical and spiritual obstacles in order to retrieve Jack's sword. Ashi's hunt for Samurai Jack helps her to realize his effect on the world after coming across numerous people and places where he has altered things for the better. Samurai Jack battles to save a group of enslaved people from being used as the power source for a gigantic Mega-Robot. 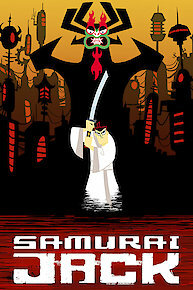 Samurai Jack unites with a deadly assassin in an effort to escape a gigantic creature that has swallowed them whole. Samurai Jack is terribly hurt, but still chooses to face one of the deadliest opponents he's ever faced, Assassins from the Cult of Aku. In the fifth season opener, Samurai Jack starts falling into madness and discovers his pysche, his own worst enemy. Show creator Genndy Tartakovsky and composer Tyler Bates discuss the crucial role of sound design. Jack tries to return a baby back to his mother. Jack must learn a unique weapon after his tribe is abducted in Africa. An old ace robot assassin is let out of retirement to eliminate Jack. Jack battles the perils of fall, winter, spring and summer. Aku shot down a prince and princesses ship down to earth, Jack helps save them. A Scotsman must put pieces of a puzzle together to help Jack get his memory back. Part 2. The Scotsman Saves Jack - Part 1: The Scotsman tries to help Jack recover his memory by tracking down the creature that caused his amnesia - the Tango Beast. A Scotsman must put pieces of a puzzle together to help Jack get his memory back. Part 1. Bounty hunters gather to capture Jack. After Aku sneezes on Jack he becomes infected with Aku's evil. Jack battles a punk samurai. Jack finds out he is a villages chosen one to embody a robo samurai to fight the mondo bot. While Jack is helping a town in distress, Aku sends a ninja to destroy him. Samurai Jack is currently available to watch free on Adult Swim and stream on Cartoon Network. You can also stream, download, buy, rent Samurai Jack on demand at Amazon, Vudu, Google Play, DIRECTV NOW, iTunes online.